Our new AerMax installation kit mounts the air pump on the tank itself. The traditional AerMax that we’ve sold for many years now comes with an optional installation kit. 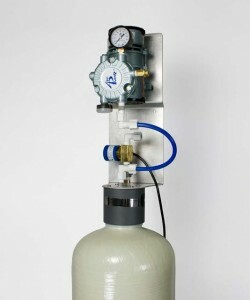 With the traditional AerMax unit, the air pump is wall mounted beside the treatment tank. The new optional installation system, pictured above, allows the air pump to be installeed on top of the tank itself, providing a more compact, vibration-free mounting. The vertical mount system is now available, as is a timer control that makes installation much easier than previously. Please call 940 382 2814 for details.